On the clean fuel front, our Clean Cities coalitions put cleaner trucks and buses on our roads (from CNG to propane to electric) and new alternative fuel stations on our corridors. One of our more recent developments is on the cutting edge of electric vehicle technology. You’ve likely seen electric vehicle (EV) chargers around town—more than 1,000 are installed in the KC metro—but this project is different. We’re using Kansas City’s streetlights to charge electric cars. It’s cheaper than installing a charging station on a curb or sidewalk and enables EV drivers to charge at many locations, not just at a mall or in a parking garage. It’s also a way to make owning an electric car practical for apartment residents across the metro area. We were excited to receive EPA funding to cut regional diesel emissions by replacing 21 heavy diesel long-haul trucks with natural gas, and installing 128 electrified parking truck spaces in a Joplin, MO truck freight yard. The truck stop electrification project is set to be the largest in the country. In addition, with the help of this funding we will be assisting the city of Dodge City, KS, in buying their first natural-gas powered trash hauler. Diesel exhaust is one of the biggest single problems for air quality, and one of the biggest single health issues for people with respiratory issues. Dollar for dollar, cutting diesel use is one of the most effective approaches to cleaner air. We also completed two local projects that we’re pretty proud of. 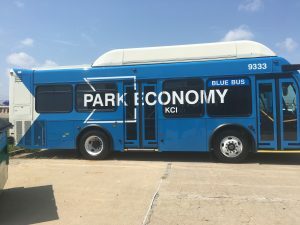 One is the deployment of four all-electric shuttle buses at KC International Airport. This is a first step—the plan calls for a total of 11 zero-emissions buses. It’s the first deployment of all-electric buses owned by a major American airport. We also helped Grain Valley Schools fund a propane fueling station at their bus barn to power their growing fleet of propane school buses. Not only is propane about half the cost of diesel, but kids are more vulnerable to diesel exhaust than adults, and propane is far cleaner than diesel fuel. For more information on clean fuel deployments, or on funding opportunities for your fleet, check our website or contact David Albrecht at (816) 531-7283. An all-electric zero emission bus at Kansas City International Airport. MEC’s Energy Solutions Hub is aimed at improving energy efficiency in small- and mid-sized commercial and industrial properties. The Hub provides connections and direct assistance to municipal, commercial and industrial properties, and is particularly helpful for those large enough to face big utility bills but small enough that they don’t have a building engineer or energy specialist. The Hub is designed as a turn-key system to make energy savings simple for business owners. After getting a handle on the needs of a company, we connect the owners with contractors and building analysts, and provide assistance with utility-based rebate programs designed to make the transition to more efficient lighting, industrial and HVAC systems as affordable as possible. For more information on the Energy Solutions Hub, check our website or contact Sara Lamprise at (816) 531-7283. Once again, outreach and community engagement was a major activity for MEC. Our staff worked with the Missouri Department of Natural Resources on the state’s Volkswagen settlement plan to mitigate air emissions and aggressively promoted funding opportunities as they became available. Our leadership and staff worked throughout the year to educate legislators in Kansas and Missouri on energy and transportation issues, and participated in ongoing technical discussions on the benefits and opportunities associated with Alternative Fuel Corridors and statewide electric vehicle charging plans in Kansas City and Missouri. Our staff explained the essentials of home solar energy to the Homes Association of Kansas City, and welcomed the Green Business Network to Project Living Proof (our energy efficiency and sustainable living demonstration home) as well as Heartland Conservation Alliance’s Green Guard graduates. We brought electric test drives to the Illuminated Waters Festival and charged up prospective EV owners for September’s National Drive Electric Week at Black & Veatch World HQ. You also would have found us presenting and exhibiting to statewide audiences at WEALTH Day, Dialogs on Sustainability, Kansas Energy Conference, the Kansas Power Pool, and to municipal audiences in Kansas City (both KS and MO), North Kansas City, Garden City, Liberal, Wakeeney and Dodge City. Events like these brought our team into direct contact with at least 850 engineers, business owners, legislators and members of the general public, with help from a vigorous and expanding social media presence on Facebook, Twitter and our website. 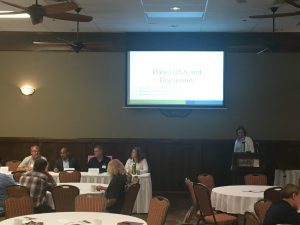 A panel discussion at our CNG workshop in Garden City, KS. After 35 years on Paseo Boulevard in the heart of Kansas City, MEC moved at the end of October. We’re now located at the Non-Profit Village at 31 West 31st Street, still in midtown Kansas City. We marked 3 memorable occasions on November 9, celebrating 35 years for MEC, 20 years for Kansas City Regional Clean Cities and 5 years for Central Kansas Clean Cities at a reception held at Lifted Spirits Distillery. We were delighted to celebrate with nearly 120 guests, friends, MEC alumni and stakeholders. We honored six organizations as Agents of Change for their commitment to clean fuels and energy efficiency. Please join us in congratulating Grain Valley Public Schools, North Kansas City Public Schools, Kansas City Aviation Department, Kansas Biodiesel Consortium, The Energy and Environmental Training Center of Kansas City, Lee’s Summit Medical Center, and Jump Start for their accomplishments in and support of clean fuels and energy efficiency. At our 35-Year Anniversary Gala, we also announced two new ways to engage and support our work: a monthly giving option and the Diamond Partnership. Our Diamond Partnership is an exciting new way to work with our Clean Cities and Energy Solutions staff, along with three other energy-focused nonprofits in the region: Clean Energy Business Council, Green Business Network and USGBC-Central Plains. This membership option allows businesses to receive membership benefits from all four nonprofits and to support their missions at half price! To learn more about this membership, contact Thomas Murphy at Thomas@metroenergy.org. The MEC team celebrating at our 35th Anniversary Gala. We’re looking forward to 2019 when we can dig into the “Streetlight Electric Charging” project, welcome a dedicated volunteer from the AmeriCorps VISTA program to support our Energy Solutions Hub, and continue our important work through Clean Cities, Project Living Proof and the Energy Solutions Hub. And… we are excited to launch Electrify Heartland 2.0 to increase use of the existing EV chargers and expand access region-wide to make electric cars a mass market option. We are establishing a steering committee, and will be unveiling more information in the upcoming weeks! Kelly Gilbert, our Executive Director, and Beth Pauley, our Communications Coordinator, are headed to Washington D.C. to attend the Energy Independence Summit and educate our elected officials on the importance of a diverse, domestic, and clean fuel mix and the impact of our projects in their respected districts. We’re traveling with members and supporters GPS Insight, Urban Air Initiative, and Orange EV. 2018 was a year of exciting growth, as well as Kelly’s first full year as Executive Director, and 2019 is already shaping up to be another memorable year! Without you, we wouldn’t be able to accomplish these achievements. Thank you for all that you do to support energy conservation in the heartland. Join us at our Open House to learn how you can continue to support our work!